Depeche Mode's twelfth album opens with a tone of such a high frequency that maybe some of their older fans may at first struggle to make it out. One can imagine men of a certain age, with a penchant for black 501s, black leather jackets and white vests being asked to sit in a booth and raise one finger when they thing they can discern the sound. It is joined by a burbling, clicking, analogue and insectile burr, which slowly becomes an orchestra of ancient and angry sounding synth tones. For a few disorientating seconds this sounds spookily like the Anglia TV ident from the 70s, before building into THX proportions. But this doesn't signify a "stunning return to X", or "their most uncompromising album since Y" or a "hauntological take on Z". Instead this fanfare, reminiscent of the work of the Radiophonic Workshop, is more a warning to the listener which says: "brace yourself, we have invested in a lot of vintage synthesizers, creaking drum machines and dusty sequencers, and we are not going to shy away from using them." If anything this slightly disturbing intro is misleading because it ushers in what is arguably the 29-year-old band's most mellow and mature album to date. The actual track 'In Chains' is the kind of bluesy cyber spiritual that the band made their own between 'Personal Jesus' in 1989 and 'John The Revelator' in 2005. Dave Gahan's smooth croon is set off by the feverish efflorescence of Martin Gore's guitar. This is one of Dave Gahan's three contributions as a songwriter to the main album, worked on with his writing partners Christian Eigner (DM's regular drummer) and Andrew Phillpott. The construction of Playing The Angel was marred by jockeying for position between the singer and Martin Gore but this has given way to an almost Socialist division of labour. Instead of Gahan insisting on having a certain amount of space on the album before agreeing to even set foot in the studio now both parties (i.e. Gore and Gahan. Andy Fletcher doesn't write the music or play any instruments) write according to their abilities and the group as a whole receives according to its needs. This is as it should be. Gore remains the primary songwriter and Gahan is the front man and secondary song writer, while Fletch, perhaps more crucially is a facilitator. He stops the other two from killing each other and acts as a necessary intermediary for Gore. This is minimal acid blues and concerns the singer's addictive nature, and its minimalism is emphasized by the use of old equipment and a prominent, primitive rock guitar. The first single is classic Mode with Gore casting Gahan in the role of corrupt preacher, like a character from Flannery O'Connor's southern gothic novel Wise Blood, railing against his almost apocalyptic bad luck. His slightly mad ravings elevate the scenario to the scale of black comedy: "I was born in the wrong house / with the wrong sign / in the wrong ascendency. / I took the wrong road / that led to / the wrong tendencies. / I was in the wrong place / at the wrong time / for the wrong reasons / on the wrong night / of the wrong day / on the wrong week. / I used the wrong method / with the wrong technique". Buzzing MOOGs are the ideal accompaniment to the stentorian backing vocals that admonish the singer for all his bad choices/lack of choice, like an over-zealous, slightly gothic Greek chorus. This song, like 'Jezebel', harks back to 'Lillian' from Playing The Angel and appears to be a bit of an eco-ballad or an elegy to the not-yet disappeared beauty of planet earth. However the melancholia of the synth and the sentiment aren't reflected in Gore's almost raucous guitar playing. Many of these songs are built around a pop, proto industrial skeleton like material you'd find on Some Great Reward or Black Celebration but these tunes themselves are, necessarily, much more mature in tone and content. Abrasive metallic textures underlie this gentle meditation on death and (possibly) rebirth or continuation through children. There has been some talk of retro-futurism influencing this album and it's certainly clear on this track, with Gore's surf guitar calling to mind the exotica of the 50s and 60s mixed with the electronic tones of the space race era. 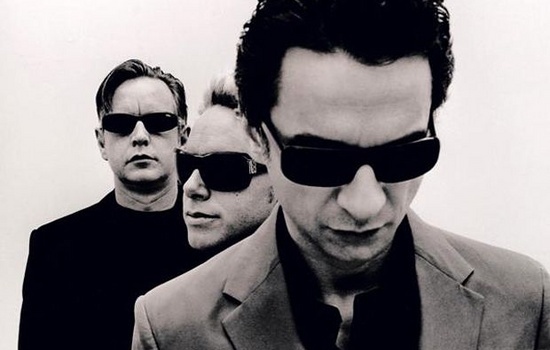 How have Depeche Mode not already recorded a song called 'In Sympathy'? Anyway, there was a time that when the band were never far from singing about teenagers and being extremely creepy ('Behind The Wheel', 'Question of Time' etc) but nowadays they seem to be presenting enthusiastic and motivating songs to various children and young relatives. This isn't a bad song by any stretch but there's something ever so slightly prissy about the arrangement of it. There's no point in having loads of really cool old synth gear and then drowning it out with big washes of simplistic guitar. This is much better, starting a bit like OMD's excellent 'Messages' before revving up the spiritual vibes again. Rather than being Gahan singing soulfully with Gore handling angelic backing vox, this is a straight duet between the two which can be read as the self-determination of recovering alcoholics and drug users who are now clean or a song declaring the end to inter-band arguing. The song has unashamedly massive Beatles-y melodies and stadium sized positivity. The necessary grit is provided by atonal squawks of noise and electro rushes. An album highlight. Gahan's finest songwriting moment on the album and possibly to date. This is a real piece of drugged up shoegaze, with warm opiate/amniotic fuzz pop guitars that calls to mind the Jesus and Mary Chain, Ultra Vivid Scene and Spiritualized. The lyrical conceit is one that Jason Spaceman from Spiritualized would be familiar with at least - the analogy between a relationship with a lover and a drug. In the background Steiner Parker synths create random misfires of noise and tune. Sumptuous. The Eastern synth pop style of this instrumental, made me initially think of Ryuichi Sakamoto and Yellow Magic Orchestra but Martin Gore insists it makes him think of Martin Denny. So let's say that it sounds a little like YMO's cover of Denny's 'Firecracker' and an interesting piece of retro exotica and leave it at that. Overall Ben Hillier (Doves, Blur, Elbow) has done a grand job on Sounds Of The Universe. He has grasped the overall concept of finding spirituality in science and physics – a kind of religious atheism – and how our expectations of technology have changed over the years by marshalling a combination of bleeding edge technology and anarchic vintage equipment. Trouble is in this instance that this track sounds very much like one or two other tracks elsewhere on the album. The synth chord changes on the verse put this reviewer in mind of Genesis or Peter Gabriel in the early 80s - but in a good way. More from Martin Gore's fascination with exotica. It's easy to imagine the youthful, bleach blond, rubber dress wearing Gore of yore singing this in the manner of a wistful but asexual torch singer. But this almost cabaret number is dedicated to a young woman who (presumably) has a bracing line in the kind of clothing that wouldn't go down too well in Saudi Arabia. This opens like a track from Violator complete with Gahan's lizard croon: "I could corrupt you/it would be easy. / Watching you suffer / girl, it would be easy." It seems that despite maturity and all, the Mode can still be slightly creepy if they want. Who knows who the 'intended victim' of the song is and what she's done to upset the Basildon boys but this is perhaps a reminder that no matter how old they get physically, we don't want them to mature too much.